Cincinnati Reds fans can see Paula the penguin at Great American Ball Park on April 12. 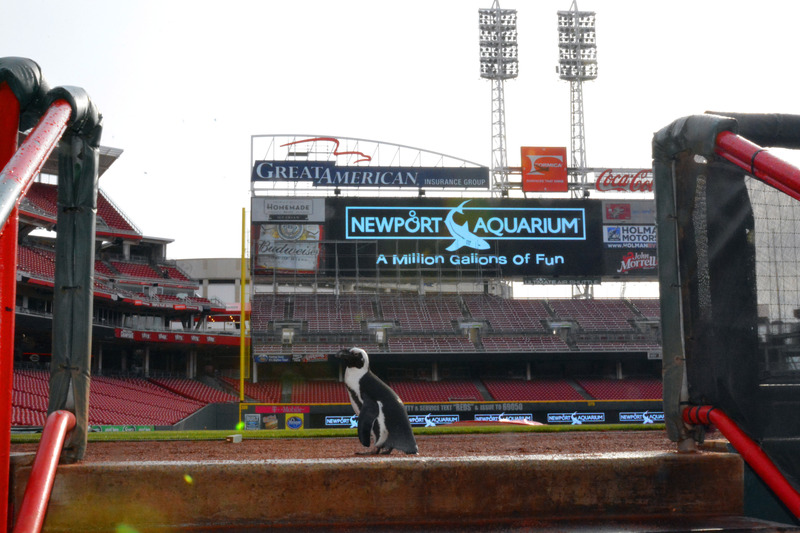 NEWPORT, Ky. — In time for Opening Day, Newport Aquarium and the Cincinnati Reds are teaming up to provide Reds Country with exclusive promotions, along with one very special animal encounter, throughout the 2015 baseball season. This distinctive partnership will allow baseball fans and animal lovers of all ages to experience the thrills of two of Greater Cincinnati’s jewel attractions. Paula the penguin will deliver the game ball at Great American Ball Park during pregame ceremonies on April 12. Paula the Penguin Game Ball Delivery: Newport Aquarium’s Paula the penguin will deliver the game ball to the Great American Ball Park pitcher’s mound during pregame festivities prior to the Reds’ afternoon matchup against the St. Louis Cardinals on April 12, the first Sunday home game of the 2015 season. Following first pitch at 1:10 p.m., the famous African penguin will greet fans at the Kroger Fan Zone before participating in a Reds Heads Kids Club Q&A session at the Wiffle® ball field during the third inning. Combo Ticket Nights: For select 2015 home games, a family of four can enjoy a trip to Newport Aquarium and a Cincinnati Reds game for as low as $100*. This combo includes a voucher for one general admission ticket to Newport Aquarium per each Reds game ticket. The combo is available for Reds home games on April 27, May 11, June 21, July 1, July 20, Aug. 4, Sept. 4 and Sept. 6. The Cincinnati Reds-Newport Aquarium combo ticket can be purchased online at reds.com/newportaquarium. Annual Passholder Appreciation Nights: Newport Aquarium Annual Passholders can purchase Cincinnati Reds tickets at exclusive pricing during Annual Passholder Appreciation Games, which are May 11, June 21, July 20 and Sept. 4. Passholders can purchase these discounted tickets at reds.com/napassholders. Newport Aquarium/Ride the Ducks Newport at Opening Day Parade: Newport Aquarium and Ride the Ducks Newport will be entry No. 106 of 200 in the 96th Findlay Market Opening Day Parade on April 6. The parade is set to begin at noon near Findlay Market on Race Street in downtown Cincinnati. Newport Aquarium and Ride the Ducks Newport employees will be highly visible in a Cincinnati Reds-decorated Duck, an amphibious vehicle modeled after the famous World War II DUKW machine. Ride the Ducks Newport is scheduled to begin 2015 tours on April 10, weather permitting. Visit newportducks.com for the complete operating schedule. This entry was posted in Cincinnati Reds, Penguins and tagged African penguins, baseball, Cincinnati Reds, newport aquarium by NewportAquarium. Bookmark the permalink.